Tuberculosis (TB) remains one of the greatest threats to human health in the world. A neglected disease, it infects one third of the world’s population and is the second leading infectious killer, causing about 1.5 million deaths per year. Worldwide, MSF is treating more than 30,000 patients for tuberculosis, and advocating for research into improved treatment regimens. Yet in many of the countries where Médecins Sans Frontières (MSF) works, much remains to be done to properly diagnose and treat TB. In Chad, I have seen patients treated five times, unsuccessfully, for pulmonary TB. In rural and isolated regions of the country such cases are common and investment in medical services is lacking. TB is a complicated disease – it can be difficult to properly detect, and the treatment is often long and unpleasant. These problems are exacerbated in many places where MSF works, places where people struggle to access healthcare. TB patients can be discouraged by the harsh side effects of the drugs and stop treatment, or they may lose access to the medications they need. As an emergency humanitarian organization, MSF is often stretched thin trying to treat complicated TB cases alongside other acute health needs. In Chad, we respond to epidemic diseases such as malaria, mass trauma incidents and spikes in malnutrition. Here and in other MSF missions, I have faced the difficulty of implementing TB programs alongside other seemingly endless priorities, constrained by limited human and material resources. But we cannot ignore TB – if we do, the consequences for patients become even more severe. When the disease is treated incorrectly, the TB bacteria can develop resistance to the most commonly used drugs, making successful treatment much harder. Last year, at the MSF hospital in Am Timan, eastern Chad, I treated a TB patient named David (not his real name) who endured a fever for more than two months. With the outside temperature over 40 degrees Celsius, he suffered terribly. While David suffered, I felt discouraged, fearful that he would die and hoping for an elusive breakthrough. David, in his twenties, had a cough, chest pain and was emaciated. He weighed just 45 kilograms. Each day when we visited him on the TB ward, he gave us a tired smile and agreed to stay a little bit longer for treatment, despite the apparent lack of improvement in his health. In my work with MSF, I have often found it a challenge to isolate highly infectious patients from their family and fellow patients. David came from a small village near Am Timan, and his mother kept watch over him during his hospitalization. For the sake of her own health, we implored David’s mother to stay outside of his room during his treatment, but she would not listen to us and kept by her son’s side. David kept his few belongings – blankets and clothes – neatly folded and as clean as possible, washed by hand. Yet his ward was dirty, his bed frame rusted and there was dust everywhere. This was David’s home for the duration of his treatment. David was treated for TB in 2008 but was diagnosed with the disease again in 2013. In Chad it’s not uncommon for patients to abandon our hospital despite close medical attention, detailed explanations and psychosocial support. Traditional medicine is common in this region and western medicine is not always accepted by villagers who have sought the help of local healers for generations. From March to May of 2013, David was treated with the usual TB antibiotics. Despite the treatment, his symptoms persisted. David grew frustrated. Were it not for the time we took to explain our efforts to him, with the aid of local counselors, I fear he would have abandoned treatment and likely died. 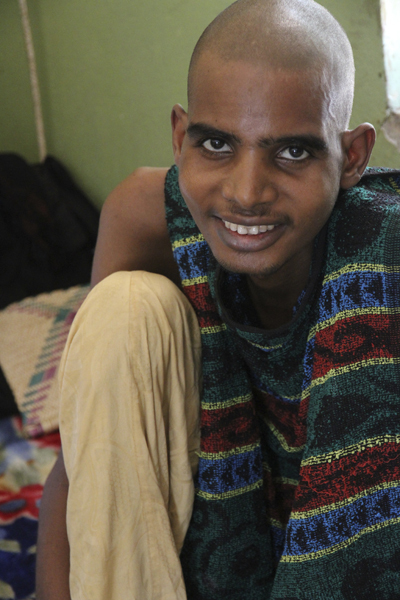 In May, David was still testing positive for TB despite the two months of intensive treatment. He spent his days in the isolated TB ward with a towel draped over his shoulder and his prayer beads by his side. Traditionally, TB has been diagnosed by taking a sputum sample and directly observing the bacteria under a microscope. This method is time-consuming and unreliable but is the standard for MSF around the world. Many cases are missed, and drug resistance isn’t diagnosed at all. Our medical team eventually suspected that David was probably infected with drug-resistant TB (DR-TB). Globally, MSF TB programs are seeing alarming numbers of patients with drug-resistant forms of the disease. Fewer than one in five people with DR-TB have access to care. In our region of Chad, patients with DR-TB wouldn’t have access to care without MSF. For some time, MSF had been preparing to test and treat DR-TB in Chad. These efforts would prove essential for David’s survival. First was the deployment of a new TB testing technology called GeneXpert. The GeneXpert machine is the size of a desktop computer. It works by detecting the genetic structure of the TB bacteria, and also tests for resistance to the most important TB drug, rifampicin. GeneXpert delivers results in two hours, instead of the months required to send samples to Europe for advanced testing. We now have the means to diagnose more DR-TB, put drug-resistant patients on treatment faster and stop prescribing ineffective medications to patients who need specialized drug regimens. We can also help expose the size of the global DR-TB epidemic. MSF currently has 26 field sites around the world that are using this new technology. David was the first patient in Chad to benefit from GeneXpert. In June we tested him with the new system and discovered that he had high-grade resistance to rifampicin. By July, the government agreed that we could start treating David for DR-TB. David then embarked on a new nine-month treatment program. The standard two-year regimen for treating DR-TB has many debilitating side effects, including loss of hearing, vomiting and psychosis. MSF has used this regimen in the past, and patients and their doctors found it difficult at best. The new treatment protocol significantly reduces the side effects and the number of painful daily injections. This increases the likelihood that patients like David will complete the treatment. The new drug regimen we offered David is not only less harmful and more effective, but is also about a quarter of the price of the two-year treatment. In September 2013, David finally tested negative, likely for the first time in six years. But curing DR-TB isn’t easy, and TB bacteria were detected again when David was tested in November. The field team suspected that David wasn’t taking his medications regularly, and made sure that a community health worker visited him every day to encourage him to stay on treatment. In December, David tested negative. David is now back home in his village, where he faces stigmatization. Motorcycle taxi drivers are reluctant to give him rides for fear of being infected. MSF community health workers explain to the villagers that David is receiving treatment and that the risks of infection are low. Yet it’s uncertain whether the community will accept David. David has monthly checkups at the MSF hospital, and daily support from community health workers. Thanks in part to his courage in persevering despite his suffering, he is on the way to being cured of TB. There are enormous challenges to successfully diagnosing DR-TB in poor countries. MSF is doing what it can, but it isn’t nearly enough – our programs are only scratching the surface of a huge global health problem. Large-scale action is needed. MSF has launched a DR-TB manifesto calling for universal access to diagnosis and treatment, better treatment regimens, and the funding to meet these goals. Please visit and sign the “Test Me, Treat Me” DR-TB manifesto. Thanks to Dr. Andreas Schoenfeld and Prosper Ndumuraro for contributing to this article.